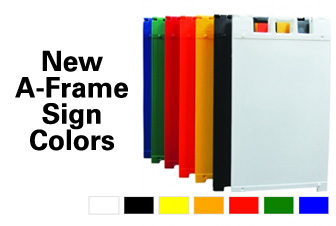 Signicade A-Frame signs now come in even more colors. The signs are durable, very versatile and affordable. Customers can now choose from a wider assortment of colors including red, blue, green, white, yellow, orange and black. These Signicade A-Frame signs are built of all plastic and have a regressed sign area to help protect the sign faces. The sign face can hold vinyl sheeting, metal Coroplast™ or acrylic sign blanks. If needed, the signs can be internally ballasted with sand to give them extra upright stability. 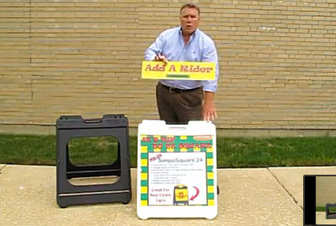 Each signicade A-Frame sign comes with a molded-in-handle for easy transportation and they stack easily.